Some days, life can feel out of control. Some days, everything seems to happen while we are still busy making to-do lists. And some days, we remember a simple truth: life is in our hands! With these 7 Liberating Steps, we can find our way back to a path of empowerment. CLICK HERE to read more of this latest article on Thought Calatog and have an empowered Wednesday! Embrace All That You Are! Are you … a writer? You bet you are! And now is your time to own it! What loving thing will you do for yourself today? ‘Open wide’ to the possibilities in the dental profession, and do please keep your jaw cracked open, too. We’re almost done with the soft tissue exam. We can learn so much from the many specialties of the dental profession! CLICK HERE to read my latest Huffington Post article and to find out if you have the chutzpah of a prosthodontist! It’s a rainy day, and yet it is filled with such sunshine – The Sunshine Blogger Award to be specific. Thank you Didi’s Art Design for adding this light to my week and for sharing such warmth on your blog. Be sure to check out all poetic thoughts that Didi’s Art Design has to offer! 1) Thank the person who nominated you in a blog post and link back to their blog. 2) Answer the 11 questions sent by the person who nominated you. I am a dental student by day and a writer by night; and in the in-between, you’ll find me on the comedy stage! It’s a busy life, and I love it! 2) What is most important to you? Laughter carries me through every moment of every day. 3) How can we achieve harmony between nations and people? Peace begins within each of us, and from there, we can share peace with others. 4) What kind of improvements you suggest for your our society? There are oh so many opportunities for growth in our world, and they all stem from a growth in not only random, but intentional acts of kindness. 5) What is your biggest wish? What a hard question! I am so caught up in the beauty of this moment that my mind can’t seem to land on something more I would want in my day! 6) What was your biggest mistake in your life? There have been only endless opportunities before me, opportunities for growth and opportunities to learn. 7) If you could bring a new subject to a school, what would it be? I have done just this! Crafting Yourself brings lessons in self-efficacy and resiliency to the hands of middle school children, all through the creativity of art! 8) How do we end poverty in our world? We begin to create equity in our world by creating equal opportunity in each domain of our world: health care, education, employment, and more. 9) What book do you find most interesting? 10) What is the meaning of friendship to you? Friendships is laughter and joy. It is sharing moments of both pain and hope with someone you trust, and exploring this world with someone who can share with you a new way of seeing things. 11) What does, “Man know thyself,” mean to you? This question is truly wonderful, because each day that I grow, this sentence means something new. I simply can’t wait to see what this phrase will mean to me in the morning. And YOU! Add your blog url to the comments and share the sunshine with all of us! You most definitely deserve this blogger award! Who most influenced the person you are today? What is one thing you wish you could add to your day? What is stopping you from adding that in? What is one thing you could empty from your day? What would you do with that freed time? When did you decide to pursue your profession? What is one thing you love about your profession? Why are you so good at what you do? If you closed your eyes and imagined the perfect day, what would you do first? Happy blogging, and enjoy the sunshine! I can’t wait to see how far this sunshine spreads! Another day, another reason to smile! 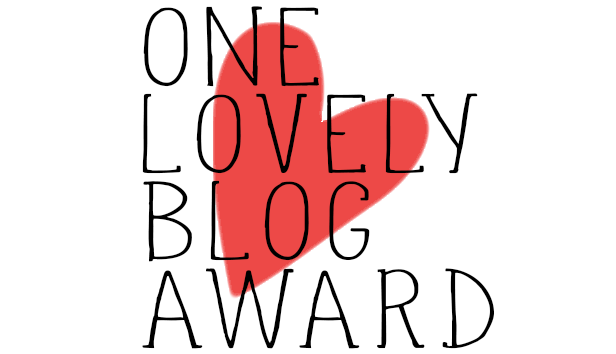 Thank you, Ally L. Mare, for the incredible honor of the One Lovely Blogger Award. I encourage everyone to stop by Write! Ally! Write! to get their daily dose of inspired writing. Let your nominees know you’ve nominated them! I set my mind on dentistry at the age of seven and haven’t looked back since. I began my journey in writing at the age of 20. If you looked into my apartment, 90% of the time, you would find me rocking my head and singing aloud to country music. I come to life in the world of comedy. I am most passionate about working with children and youth. If I had an extra 24 hours in my day, I would curl up in the corner of a book store and just write and write and write. And then I’d hit the comedy or music scene! AND YOU! Because you are one incredible writer with one lovely blog! These thirteen writers (including YOU) most definitely create ‘One Lovely Blogs’ of their own, and I can’t wait for you to check them all out!